I am one of the few people who predicted (not in writing) that Donald Trump would be the 45th president of the US since early in 2016, at a time when everyone else said it was just plain impossible, providing a long list of facts and figures that proved, for them, that there was no way under the sun that he would be elected. Back in April, I wrote a piece called “What Will We Do if Trump Is the Next President?” In that piece, I talked about things from the distance of not knowing. I wanted to be prepared. I still stand behind everything I said then, and yet now it’s the morning after, and I am directly in the reality I was only imagining back in April. So I am shocked, truly shocked, even as I am not surprised. I am shocked, because I consider Donald Trump’s election as perilous for humanity through actions and policies that are distinctly unpredictable, as everything is about him. In this context, I experience a need to reorient myself in a profound way, and that’s what the shock is about: as much as I have been critical of the status quo, and as much as I believed that we were already marching towards more and more destruction, it was familiar. A Hillary Clinton presidency, from my perspective, would have been more of the same. It would have allowed me to continue to live my life and do my work with some lull, some small and subtle denial of the global situation we are facing. With Donald Trump being elected, that luxury is no longer possible. I am also shocked because of the vast disconnect between my own prediction of the next four years negatively affecting significant portions of the US population and the observable fact that so many people voted for him. If I am honest with myself, I don’t really understand how it’s possible, how it came to be. I believe that a Trump presidency will intensify the plight of low-income people of all demographics, including in particular low-income whites, Trump’s core constituency. How is it that they came to vote for him, then? Without understanding it, I wouldn’t know how to respond, or what to even envision as a way to create change. It is too easy to write off large swaths of the US public as “stupid.” I don’t believe people in the US possess any more or less basic intelligence than people anywhere else, in any demographic or circumstance. To imagine human beings who are not in any essential way different from me making a choice that I consider so terrifying points me to a different level of analysis, one that insists on seeing the humanity of all, and thus focuses on social, political, economic, and cultural conditions that might explain why some groups of people chose this direction. Thankfully, I don’t have to start from scratch. Based on the analyses of a few thought leaders, my combined conclusion is that an either/or narrow choice, especially between two candidates who are both disliked, in the context of an unstable world in which many feel betrayed by the establishment and frightened for their ability to live well into the future, cannot yield wisdom. This is a mouthful, and now comes the unpacking. Last night, when I talked with Sue Holper, my daily exercise phone buddy, we were commenting on how we are expected to vote from a place of being passive spectators, without full engagement, certainly without getting to the needs we have and being able to make choice from them, and without connecting with others to forge collaborative and creative paths. This, and the idea of checks and balances, are both foundational elements of liberal democracies. They presume the very notion of human beings that is at the root of capitalism and classical economics: a self-interested, rational person, who could not possibly be thinking about the whole, only about their own interest. When all are doing that, with little mutual-influence or coordination, the result is supposed to yield wisdom, both economically and politically. It doesn’t. I derive solace from knowing people like Tom Atlee, founder of the Co-Intelligence Institute. In his piece Crazy politics? How much longer will we wait?, he focuses on how the political system could be made wiser and saner. It won’t happen by changing who the candidates are. It can only happen by changing the way the system works. He documents a few dozen possibilities, ranging from minimal tweaks to wholesale revamping of electoral politics that allows people to participate differently in how societies are run. This is the stuff of hope, of what nourishes me to keep going. And this is not the system we have. In the midst of the devastation, I find it meaningful and significant to understand fully why the political system we have now in place is so capable of generating more of the same or worse, and rarely better. Not better in the sense of making it work for more and more of us and for the world and all of life, though sometimes better in circumscribed measures (more people now have access to health care than before Obama’s presidency, and that is likely to now be taken away). This election was unique in that both candidates were disliked by many, and the idea of the lesser of two evils was also the motivation for many conservatives, not only liberals and progressives. Just as many people voted for Clinton for fear of a Trump victory, many others voted for Trump for fear of a Clinton victory, not specifically because they liked or approved of Trump. (In fact, I found a fascinating philosophical analysis of the issue, from a conservative perspective, here.) Either way, many people voted out of fear, not because of actively wanting to have their candidate be the next president. This is clearly one way in which the system reduces the possibility of an outcome that taps into people’s wisdom. When we are in fear, our thinking is affected and diminished. We are less likely to reflect on the larger whole and more on our own survival and that of those closest to us. This kind of fear is also deeply related to the history and analysis I read in Michelle Alexander’s The New Jim Crow. This is why I see Trump’s election as the result rather than cause of where we are heading. In her book, she provides ample documentation for how low-income whites, Trump’s core constituency, have consistently been invited and pushed to distance themselves from low-income people of color, and especially African Americans, and in this way used to support the severe mistreatment of African Americans which continues, now in a new guise of “War on Drugs” and the growing association of criminalization with Blacks. This is one of the ways of explaining how it is that white working class people have come to identify with the corporate elite that is directly responsible for the progressive diminishment of their livelihoods. As an example of this: it is corporations that have consistently dismantled and outsourced jobs that working people of all races have had access to previously. This trend of identifying upward, against the group’s so-called rational interests, has been intensified by the Trump campaign with its deliberate acts of scapegoating vulnerable populations and appealing to the anger and resentment of white working-class men in particular. This move, as Michelle Alexander repeatedly shows, has been a consistent thread in the US since whiteness was invented during slavery. Once again, a two-party, winner-takes-all election is not conducive to transformative thinking. The only true alternative would be questioning the fundamental assumptions of the world we live in. And yet, as Michael Lerner points out: “Most Democrats, social change activists, and environmentalists don’t want to look at the need to transform the larger economic system.” Why? In the context of fear, it’s perhaps too risky, and that fear consistently paints the Democrats as a pale version of the conservative platforms, not usually in a place of a clear, inspiring vision. Bernie Sanders’ candidacy provided such a vision for many, and there was consistent data that suggested he stood a much better chance at winning against Trump than Hillary, who was, and was seen, as an establishment candidate. By many accounts, Bernie Sanders was actively prevented from winning the nomination, in large part because, like Donald Trump, he was a disruptor of business as usual, and didn’t in any way “prove” himself to the establishment. Michael Lerner’s core points bear repeating, and I would urge readers to look up his article as well as possibly attend the “Now What?“ conference that Tikkun is organizing this weekend to support planning for what comes next. A second core dynamic is the fallout of the belief in meritocracy that leads to self-blame for those who don’t “make it” in the accepted, normative sense. Self-blame is extremely poisonous, and it’s then a relief to find others who can be scapegoated. This is one of the strong elements of Donald Trump’s message. Of course it would appeal to alleviate the unbearable weight of insecurity. Such dynamics help me understand even more fully the deep alienation that has led working class people, both in the US and in Europe, to vote for conservative and right wing candidates and policies. Arnold August argues that who will be the next president is determined by what he refers to as the ruling elite. Both in his article and in a book I had read of his, he is making the claim that Barack Obama was fully supported by the ruling elite. Given how much even the Republican establishment was distancing itself from Donald Trump, I must conclude that this result is not what was planned, by anyone. In that the establishment itself may be shaken up by this outcome, there may be the source of some possibility. Many of us who care for life on this precious planet know that it is not possible to both continue business as usual and transform things. While this is by far not the outcome I had hoped for, I am slowly edging my way towards looking for the possibility of a new coming together in opposition to the larger forces that put in place one presidency after another that doesn’t change the underlying logic that divides us and pits us against each other. What I truly hope for, and plan to keep working towards regardless, is the collaborative future I envision, in which resources are managed collaboratively by their users, as humans have done throughout our life on the planet; in which decisions are made using technologies and processes that support participation and collective wisdom; and in which care and generosity are, once again, allowed to flourish. Because I don’t know what will get us there or not, I continue to use my privilege, including especially my relative capacity to speak up without facing major risks, as well as access to words and to many relationships, to do what I know to do. This is why I speak here. May we live to see better times. Image Credits: Top: Donald Trump Signs The Pledge, by Michael Vadon, Flickr (CC BY-SA 2.0). 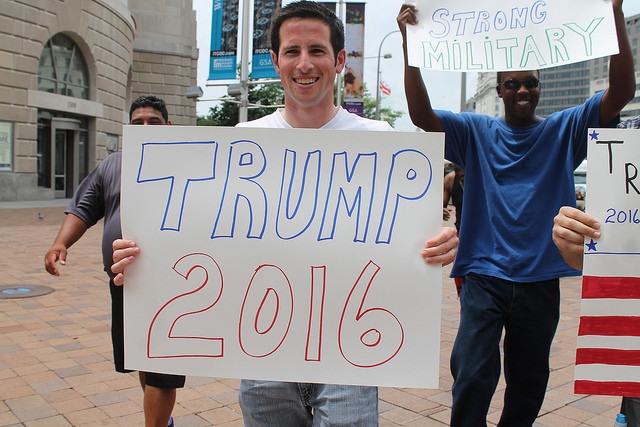 Below: Donald Trump supporters, IMG_2543, by Elvert Barnes, Flickr (CC BY-SA 2.0). This entry was posted in Uncategorized and tagged Arnold August, Donald Trump, Michael Lerner, Michelle Alexander, Tom Atlee on November 10 / 2016 by Miki Kashtan. In the midst of the shock, the sadness, the anger and the fear, in the midst of the mourning, I found a few minutes to read your post and ponder these election results. I connect with what you say, Miki, about the ways a Clinton presidency “would have been more of the same”. For me, also, continuing business as usual might have been possible with a Clinton win. It just isn’t possible now. In some mysterious way this election seems to be bringing me out of a long period of lethargy and confusion into slowly emerging clarity and focus. Second, I so appreciate the way you bring me back to the deep underlying desire to see the humanity of all. Recently I found this article about Glen Beck in the New Yorker. So words do matter. And there is hope. The system we are entwined in doesn’t serve us well in so many ways. Yet somehow, as we reach out for each other in the darkness, I begin to believe in possibility. Something’s wrong with the comments function: if you have any idea why I can post comments and some others can’t please let me know, and if you can’t post your comment, please send it to me at dave@baynvc.org and I’ll post it. Thank you for this. Lots of people talking about this online and in person. I appreciate everything you’ve share including the links. While I am also in a bit of shock over this, like “Oh, God, this is for real,” there is something else going on for me. There was something that I was seeing during the campaigns and even more clearly now, which is the possible gift in all of this. No, I cannot to sugar coat this. And I don’t want to. This will likely be a nightmare for so many people and the planet in so many visible and invisible ways. But the gift that I see is that we have already been living in a nightmare and we have been asleep at the wheel and now we are being forced to wake up. I actually don’t think “we” is everyone. I think it’s specifically U.S. Americans that are asleep. Its an interesting metaphor because for many in and outside the U.S. they have already been living a “wakemare.” I just made that up. And it’s a matter of circumstantial privilege to stay asleep and think it doesn’t matter. I think what you have pointed to is that Trump is not the issue, by himself. Oh, he’s bad news, for sure. But bad news is just news that you don’t want to hear. We need to start paying attention and getting radical in a way that has so far not really happened on a necessary scale in this country. Trump is giving us the gift of showing us, in our faces what needs attention (i.e. love) and healing. My concern is that there will be too much focus on Trump himself rather than on what he is giving voice to. Its easy to focus on him. He is outrageous. And yet what is truly outrageous is the world we are living in and the fact that we are tolerating it in so many ways. That’s what’s outrageous. Trump is to me like a fever rising from the disease of our social ills. To treat an illness you have to go to the source of the imbalance or the loss of wholeness. Bringing life into balance and mending the broken and separated pieces. The fever serves to burn off what isn’t right in the system. In that sense Trump gives us slivers of truth in an overall platform of insanity when he says things like, “drain the swamp,” or screams about our broken system. He is saying we need to start over. It’s not working anymore. Trump is a problem, but he is not our biggest problem. He is the smoke rising from the fire below, or the symptom of a deep systemic illness. Sepsis, if you will. As the fever rises it gives us critical information about what is happening. The opportunity here is to take what is being shown to us, inescapably, as a nation, as a world, and allow it to come to the light of day to begin the process of healing. That’s my rant. Thank you, Sarah. This is one of the wisest comments I have seen on the election.